Just like a model railway? Left: Seen through distorted tinted windows from the 'Big Sleep Hotel' a 153 heads over Queen St South Junction heading for Cardiff Bay on Sunday 19 April 2009. 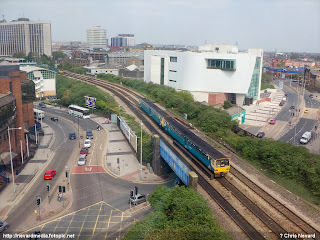 It's not often one gets an inspiring view from a cheapo faceless 'eurohotel', but for once the view out of the window of this Cardiff hotel was quite impressive with views in both directions of Queen St South Junction. The only drawback for me were the tinted wondows that didn't open! The tinting also had a slightly rippled effect making photography difficult and then there was the refection of the curtains onto the glass. The harzard of a converted office block I guess! 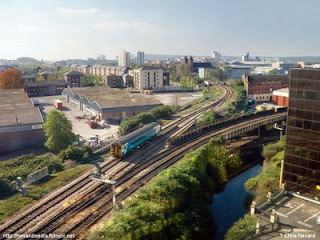 Now, imagine the same view just quarter of a century ago with class 37 hauled coal trains, or wind the clock back even further to the days of steam! The first shot would make a cracking watch the trains go by kind of layout don't you think? Right: 143607 heads a Cardiff Central bound service away from Cardiff Queen Street Saturday 18 April 2009. 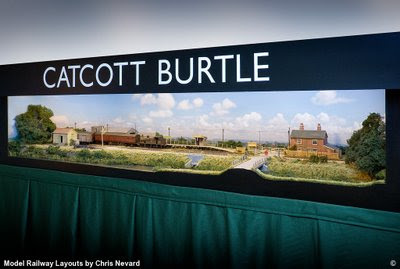 Catcott Burtle will hit the road for its first ever 2 day show on the weekend on 23 and 24 May 2009 at the highly regarded RAILEX in Aylesbury. Sunday only - up to 2 children admitted free with an accompanying paying adult or senior. This snap hopefully shows that you don’t need a pukka studio to get half decent stock shots of our pride and joys. Here’s how the recent shot of the 14xx was made up - nothing clever, just some nice afternoon light coming in through the window. The scenic track and base was knocked up in an afternoon from some spare Silfor grass matting and some foam board for a recent job I did. It’s since proven really useful for casual snaps like this where I don’t want to use a layout as a backdrop. The camera was placed on the tiny beanbag in the foreground and fired off with the self timer. The kitchen foil was there to bounce a little light back into the shadows. Tip: The CAMRA Good Beer Guide is ideal to rest the foil against. Any other solid ale or train related book will be perfect too;-) A pint glass could be yet another option…. The reason for being on the floor was due to the best light being down that low, not the effect of too much ale! 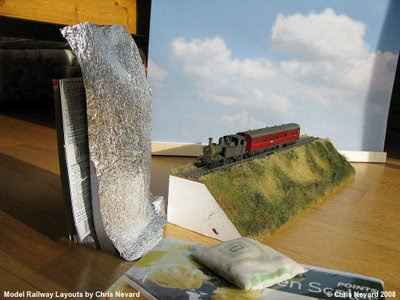 The ’sky’ background, which is best if kept remote from the scenic base, is just a large print of clouds stuck to some foamboard. Keeping it separate allows it to be positioned accordingly to allow it to fill the frame fully. If it was fixed, for 3/4 angle shots of stock I’d run out of sky if it was fixed parallel to the rear of the scenic base. Another option would be to take the whole caboodle outside and use a real background or sky of course! Ok, I admit, the smoke is fake, that's done using the 'clouds filter' in Photoshop. We all like a quick fix - here's a new one, well to me at least! 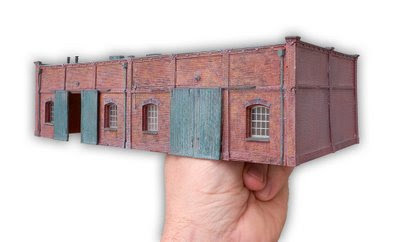 Cheap coloured pencils from the supermarket were used to add variety and relief to what what previously a drab all over 'brick colour' on this Artitec resin kit. No need to be too accurate colouring each brick individually, that would look too contrived and cartoony. It works quite well on the paintwork too for peeling faded paint. Click on the image to enlarge! Of course you can do this with paint, though this is alot quicker and will probably save you having to buy lots of extra tins of paint. Just seal in the finished job with matt aerosol like Krylon or Testors. 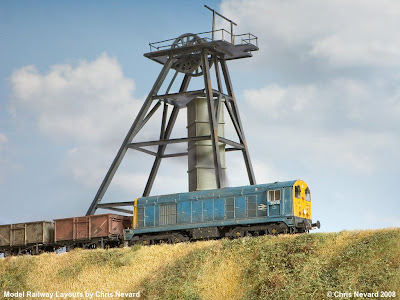 This project which is part of my Somerset Coal field inspired micro will feature in greater detail later this year in Hornby Magazine. A Titfield/Marlow Donkey 1980’s find in the garage! Back in 1982 I bought this little loco, I recall back then this highly regarded little Airfix 14xx was right there at the cutting edge of ready to run manufacturing. Airfix at the time more well known for its ancient plastic kits and 1/72nd scale model aeroplanes, for the early 1980’s was the era of self coloured plastic and missing flanges for anything that had more than 4 wheels. I renumbered this pretty little locomotive as 1451, why this particular number I have no idea, but I guess through looking at the etched replacement plates on the cabsides, that the number was simple available from one of the ‘men in sheds’ manufacturers that tickled my fancy at the time. I recall the weathering, was something I was very proud of, for back in the early 1980's people didn't tend to do such things other than maybe splash a dose of 'dirty thinners' over everything – though even that was frowned upon by the mildew ridden, adenoidal thermos touting brigade! I rediscovered this little locomotive last night whilst having a rummage through the garage looking for some stock to use for a shoot I’m doing for Catcott Burtle. The loco hasn’t run in years (20 plus I guess), with the sparks and ozone emitted from it when some volts passed through its heavy flanges suggested a generation of storage in various dank locations was not to going provide the phoenix I had hoped! Hopefully you’ll forgive the missing couplings and ground in dust! The Balony: Back in 1985, this was the scene as the wind whistled through the recently stripped down head gear as ‘chopper’ 20119 trundled past with a few empty open 16 tonners. 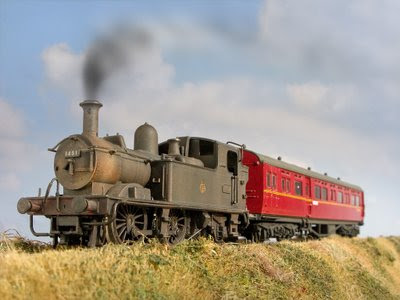 These wagons would soon go the same way as the mining industry as imported coal loaded into high capacity wagons would change the look of the British coal train forever. The Model: 20119 which until recently was preserved at Barrow Hill (see above) is a renumbered, painted and weathered Bachmann Class 20 using dry brush techniques, glass fibre brush and washes. The wagons are much the same – also from Bachmann. The headstock is a Hornby Skaledale one, a gift in exchange for some scenic work on another layout. 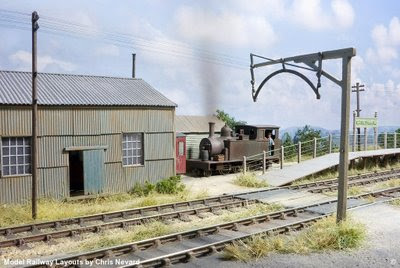 This structure is likely to be modified and incorporated into a stone structure which will form part of a North Somerset Coal mining themed layout which is currently at the planning stage. The old bull: Captured here on early Ektachrome (with the characteristic blue bias) on the photographer’s Ilford Sportsman, we find Catcott Burtle (Crossing) in the mid 1960’s, and the preservationists have just moved in with an ex 2ft 6in gauge Cyprus Government Railway locomotive. Much effort has been spent beefing the line up to avoid this locomotive sinking into the bog - for it’s not that far off the size of a standard gauge locomotive! Many peat railways in the area only used lightweight Listers and Rustons, so it looks like they have their work cut out! The real bit: Of course the above is only fiction, though Catcott Crossing did actually exist (the crossing keeper’s cottage still does, albeit hugely extended in recent years) it never had a peat railway (the peat deposits were a mile or two east of here) or any sidings. That parallel universe and pair of rose tinted bifocals are great things! The dusty foreground around the siding was achieved with Humbrol Dry Clay by simply packing it in around the C&L track, then slapping some paint on it. To represent windswept dusty old cinder ballast I’ve tried plaster in the past, but that tends to go everywhere it shouldn’t - dry clay is a much easier option! Grass is a mix of Silfor Long Winter Pasture, hanging basket liner and Noch Static Grass applied with a Grasmaster. The backscene is an enormous photographic print made up from several snaps taken in the actual the area. I then merged them together in Photoshop and got the result printed onto sticky backed plastic which in turn was sprayed with Testors Dullcote to kill the sheen. A doddle to be honest, and alot better than anything I could dream of painting! The scale? OO.